Hello there! 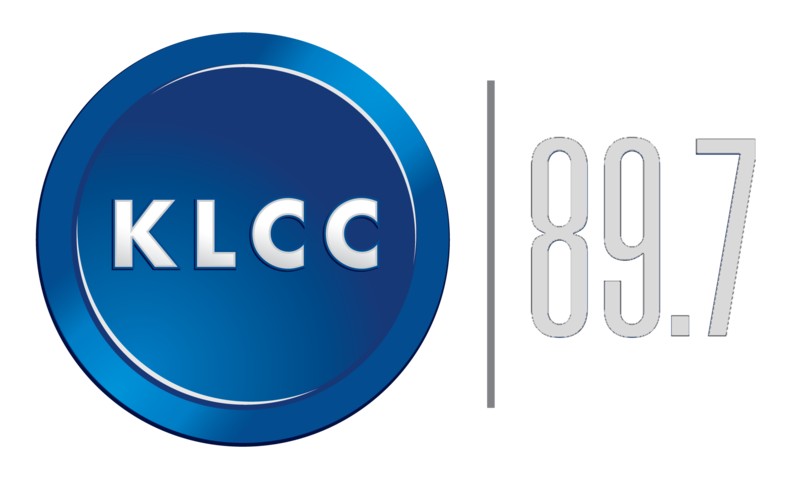 This is Sandy Brown Jensen, and you’re listening to Viz City, KLCC’s Arts Review Program. 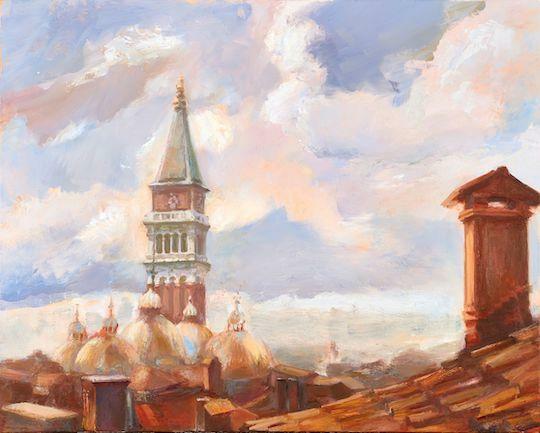 We’ve got a week of post-Thanksgiving gray weather coming up, and i can’t think of a better place to get a blast of sunshine than to stop in at the Karin Clarke Gallery at 760 Willamette to fill your eyes and soak up with images of Venice, The City of Light. I was privileged to attend Coe’s artist talk on October 20 and was fascinated by her demonstration of what a pro painter takes with her for a day of outdoor painting in a busy city. She wears a plain white smock and a broad-brimmed hat. She packs a canvas carrier held together by generations of duct tape, a big palette, a fold up easel, and a camp chair--plus paint, cleaning supplies and I imagine some cheese and bread. She schleppes this kit across town by bus and canal boat to set up in a two or three meter square piece of one of the most iconic cities in the world. The images she brought back for this very full show are of artist in her absolute prime and in the fullness of her art. These are the dreamy towers and church spires of the legendary city, deep reflections in canal water, huge, roiling skies out over the ocean beyond the still, sunlit spires of the city. 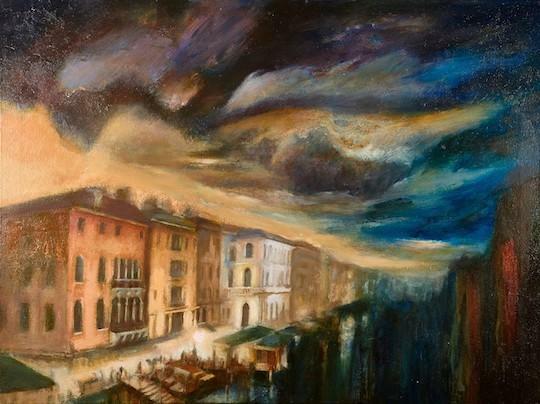 Prepare yourself for full immersion into Margaret Coe’s vision of Venice, City of Light. You’ll leave smiling and dreaming of a distant, magical world. Margaret Coe’s sun-drenched show will be up until Dec. 1st, so dodge the raindrops and come on in. See images from the show at the Viz City blog on KLCC.org.